The Roman Republic was one of the most remarkable achievements in the history of civilization. Beginning as a small city-state in central Italy, Rome gradually expanded into a wider world filled with petty tyrants, barbarian chieftains, and despotic kings. Through the centuries, Rome's model of cooperative and participatory government remained remarkably durable and unmatched in the history of the ancient world. In 146 BC, Rome finally emerged as the strongest power in the Mediterranean. But the very success of the Republic proved to be its undoing. The republican system was unable to cope with the vast empire Rome now ruled: rising economic inequality disrupted traditional ways of life, endemic social and ethnic prejudice led to clashes over citizenship and voting rights, and rampant corruption and ruthless ambition sparked violent political clashes that cracked the once indestructible foundations of the Republic. 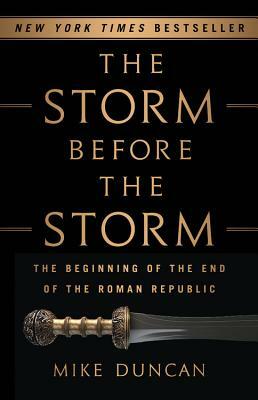 Chronicling the years 146-78 BC, The Storm Before the Storm dives headlong into the first generation to face this treacherous new political environment. Abandoning the ancient principles of their forbearers, men like Marius, Sulla, and the Gracchi brothers set dangerous new precedents that would start the Republic on the road to destruction and provide a stark warning about what can happen to a civilization that has lost its way. Mike Duncan is one of the foremost history podcasters in the world. His award winning series The History of Rome chronologically narrated the entire history of the Roman Empire over 189 weekly episodes. Running from 2007-2012, The History of Rome has generated more than 56 million downloads and remains one of the most popular history podcasts on the internet. Duncan has continued this success with his ongoing series Revolutions--which so far has explored the English, American, French, and Haitian Revolutions. Since debuting in September 2013, Revolutions has generated more than 12 million downloads. Thanks to the worldwide popularity of his podcasts, Duncan has led fans on a number of sold-out guided tours of Italy, England, and France to visit historic sites from Ancient Rome to the French Revolution. Duncan also collaborates with illustrator Jason Novak on informative cartoons that humorously explain the historical context for current events. Their work has been featured in the New Yorker, Paris Review, Awl, and Morning News. "Written in Duncan's usual congenial style. He zeros in on Rome's polarization between 'optimates' (conservatives) and 'populares' (populists), the disintegration of participatory democracy, and the concomitant rise in inequality, uncivil discourse, and violence. The parallels with modern times, and particularly contemporary America, leap off the page." "This companionable and sprightly book captures the political drama and human passion of that extraordinary story." "A lively, extremely well-informed chronicle of nearly seven decades of Roman political and social life... Drawing on ancient sources as well as modern histories, the author reveals chilling parallels to our own time... Crucial decades in the history of the ancient world vividly rendered."